In this morning's New York Times, Harvey Araton writes of Mets starter Mike Pelfrey's improvement from a shaky start this season. The turning point was the May 31 game against the Dodgers when, according to Pelfrey, he "went out there with a plan." That was to ease up, not overthrow, not give up walks. During the first inning, Brian Schneider, the catcher, puzzled by the relative softness of Pelfrey's pitches, went to the mound and asked him if he was hurt. Pelfrey said he was just making sure that he hit his spots, and added, "I want [the batters] to hit it." Pelfrey stayed in for seven innings and, as Araton notes, "began a run in which he has allowed slightly less than two earned runs a game over eight starts, winning his last five." Pelfrey had this observation about the L.A. game: "What I learned that day was, hey, I can back off if I have to; that less can be more." 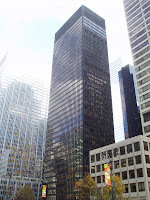 In saying that, Pelfrey was, perhaps consciously, paraphrasing one of the greatest architects of the past century, Ludwig Mies van der Rohe, whose maxim, "Less is more", is exemplified by the Seagram Building, which is iconic of the International Style that dominated post-World War II architecture. Photo of Pelfrey from Chicago Mets Fan; photo of Seagram Building from John Snavely's Blog. It's one thing for The Reverend Jesse Jackson to diss Obama for "talking down" to African Americans, but for (as I've learned from Rumproast) Lady Lynn Forester de Rothschild to call him "elitist"; well, lah-ti-dah. Icing on the cake is the comment by Betty Cracker: "Good god, what next? Amy Winehouse calling Christopher Hitchens a tosspot?" Which prompts Kevin K of Rumproast to muse: "I wonder if Winehouse would last longer at waterboarding than Hitchens did?" Greater New York: not just for New Yorkers.